Cite page (MLA): "Project Team." In Livingstone's Final Manuscripts (1865-1873). Megan Ward and Adrian S. Wisnicki, dirs. Livingstone Online. Adrian S. Wisnicki and Megan Ward, dirs. University of Maryland Libraries, 2018. Web. http://livingstoneonline.org/uuid/node/920682c6-665f-4111-8458-6247e55dc5e7. This page introduces the project team that developed the critical edition of Livingstone's final manuscripts (1865-73). Notes and Calculations for Field Diary XVII, 7-9 April 1873 (Livingstone 1873a:). Copyright David Livingstone Centre. Creative Commons Attribution-NonCommercial 3.0 Unported. 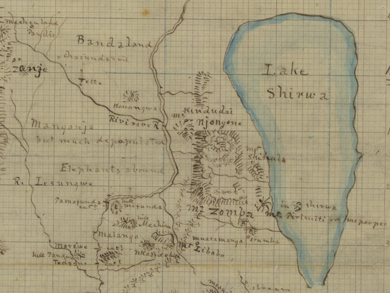 This previously undoucmented fragment came to light in 2013 as the project team prepared to image the Livingstone manuscripts held by the David Livingstone Centre. The dated entries span 7 to 9 April 1873, the last month of Livingstone's life, and are similar to the entries for the same dates in Field Diary XVII (see Livingstone 1873:-). The fragment indicates that even at this late date in his life, Livingstone continued to take his manuscripts through multiple stages of revision.